China’s stock market slide and some weaker manufacturing data have sparked a sharp sell-off in equity markets. 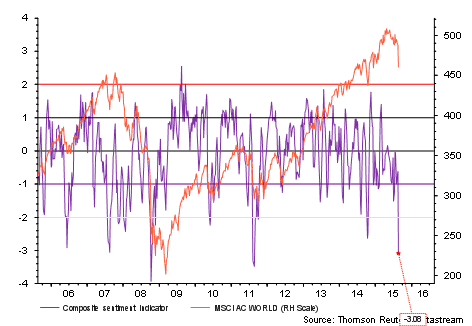 Our composite investor sentiment indicator has signalled one of the strongest contrarian buy signals on record with a depressed reading comparable with the onset of the great financial crisis in 2007, the Lehman failure in 2008 and the worst point of the euro crisis in 2011. This suggests a strong bounce, especially if we get policy shifts to turn market sentiment around. China will ease further, including on the fiscal side. Japan is likely to step up monetary ease in response to yen strength. Meanwhile policy will end up looser than expected in the US and Europe. We remain cautious on Asia ex Japan and Emerging Market equities as we are not optimistic about Chinese growth but it is hard to see how lower commodity prices and less hawkish monetary policy are a negative for the US consumer or the US stock market. We remain positive on equities and we are buying the dip on Wall Street. We see great similarities with the Asia crisis of the 1990s with the US generally on a path to monetary tightening but with Asia slowing, this time led by China not Japan. 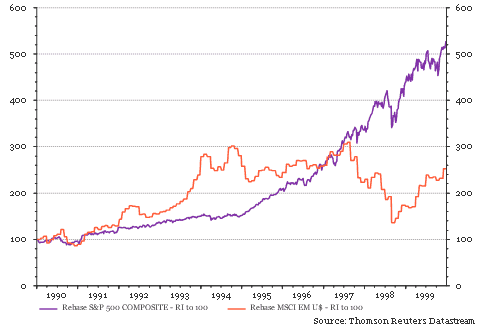 There were many shocks along the way over that decade as emerging market equities and commodities bore the brunt of the deflationary forces but US equities returned 400% over the period as a whole.